The focus of this project is to identify geologic units containing deep saline reservoirs, or sinks, that might be suitable for effective, large-volume geologic storage of CO2 generated by power plants in North and South Carolina. All data used to evaluate the suitability of the potential geologic sinks are from preexisting geologic studies, the majority from published literature. Geologic units underlying most of North and South Carolina do not meet minimum suitability criteria necessary for long-term storage of CO2. Hence, in order to match potential sources of CO2 with potential sinks, a process known as source-sink matching, CO2 will have to be transported before it can be injected into the subsurface and isolated from the atmosphere and freshwater resources. 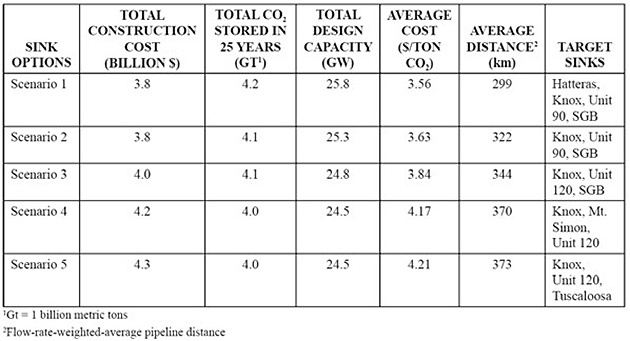 Evaluation of the constraints to transport CO2 generated in the Carolinas, including pipeline costs, was conducted by the MIT Laboratory for Energy and the Environment in late 2006. The pipeline cost estimates (in 2006 dollar equivalents for materials) include neither the cost of capture/separation at the plant nor cost of compression or injection at the CO2 storage site, which are beyond the scope of this assessment. The combined estimate of capacity for these three contiguous, vertically stacked sinks is approximately 15 gigatons (Gt). 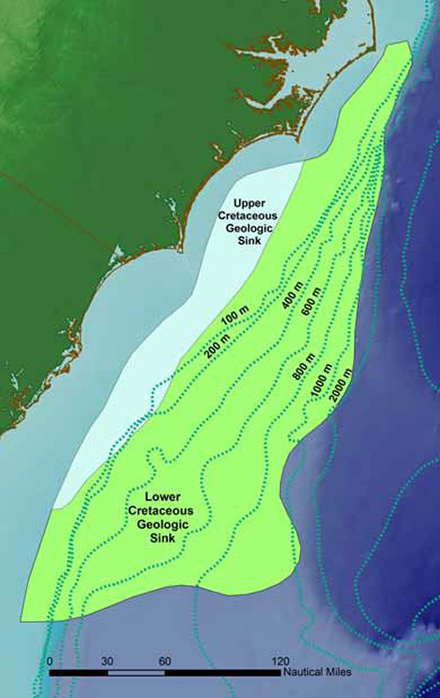 Two potential CO2 sinks are present in geologic strata below the Atlantic seafloor, offshore from Cape Hatteras, North Carolina, to Brunswick, Georgia. Both of these potential sinks are overlain by low-permeability seal layers, the shallowest of which lies between 200 m (660 ft) (landward) and 2,000 m (6,600 ft) seaward below the seafloor (Hutchinson et al., 1996, 1997). Lack of extensive drilling in the Atlantic offshore from the Carolinas means that seal integrity should be excellent, but results in few available hydraulic property data. Using core data collected at other western Atlantic drill sites, we have estimated capacities of about 16 Gt for the shallower (unit 90) and up to 175 Gt for the deeper (unit 120) potential subseafloor sinks. 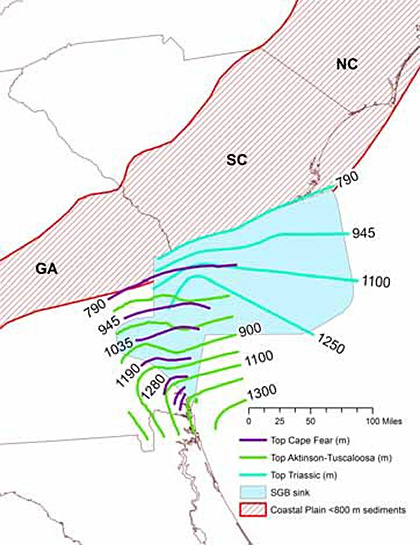 The sinks identified offshore from the Carolinas are not as well characterized as would be needed for sequestration and would require investigation to determine suitability and to refine capacity estimates. Legal, regulatory, and policy implications of subseafloor geologic storage of CO2 are unresolved at this time. Because subsurface units underlying much of the Carolinas are unsuitable for long-term storage of CO2, we looked outside the states for other potential geologic sinks. Two geologic units within the Appalachian Plateau province contain potential CO2 sinks (1) the Mt. Simon Formation and (2) the Knox Group. Hydrocarbons (primarily gas) have been produced from Knox Group rocks since the early 1960's, and the potential for future natural gas production from the Knox Group is great within eastern Kentucky and West Virginia. The Knox Group also has great potential for storage of greenhouse gasses. 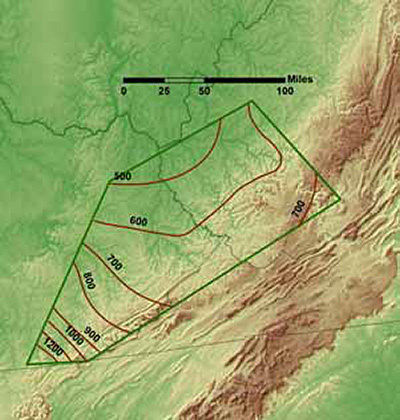 Depth below ground to the top of the Knox Group sink ranges from 800 m (2,600 ft) in eastern Kentucky to 2,600 m (8,500 ft) in southern West Virginia (fig. ES-8a). Thickness of strata in the Knox Group in this area ranges from 500 to 1,200 m (1,650 to 3,950 ft). Capacity of the Knox Group is estimated at about 30 Gt. Part of the source-sink matching process requires estimates of the cost of CO2 transport to a specific potential geologic sink. For purposes of this study, we focused on the potential for transportation by pipeline. Estimates of pipeline costs for this study were conducted by the MIT Laboratory for Energy and the Environment in late 2006. Pipeline cost estimates (in 2006 dollar equivalents for materials) include pipeline construction, right-of-way acquisition, and operation. Cost estimates for CO2 pipeline construction are based on cost data for natural gas pipelines. This may have resulted in an underestimate of costs to build CO2 pipelines because of the greater CO2 wall thickness required to contain supercritical (high pressure and temperature) CO2. Neither the cost of capture/separation at the plant nor the cost of compression and injection at the CO2 storage site are included. These elements are beyond the scope of this assessment, which is to match sources with sinks and provide a relative index of cost escalation as the distance between sources and sinks increases. 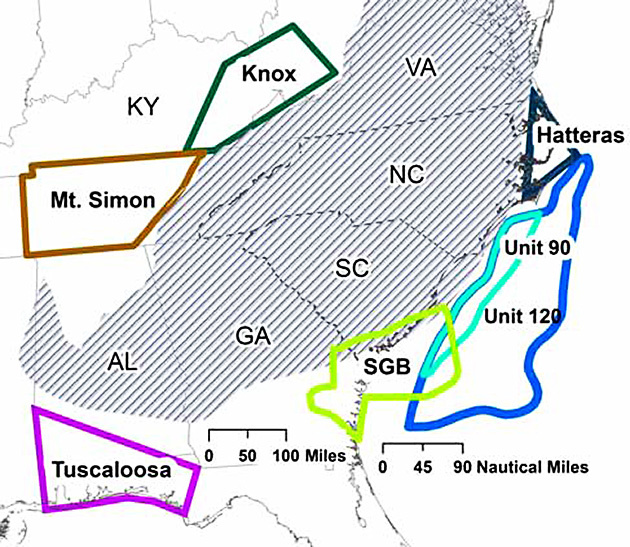 Most of the power plants in the Carolinas are underlain by geologic units that are not suitable for long-term storage of large volumes of CO2. The Blue Ridge and Piedmont physiographic provinces of the Appalachian Mountains in western portions of the Carolinas are underlain by crystalline rocks that lack sufficient overlying seals to trap CO2 in the subsurface or keep it from interacting with fresh groundwater. Sediments of the Atlantic Coastal Plain are not thick enough to host CO2 sinks and contain deep freshwater aquifers. An exception within the Carolinas is an isolated sedimentary basin encompassing the southernmost part of South Carolina that lies within the South Georgia Basin. The Knox Formation in eastern Kentucky and southwestern West Virginia. The CO2 storage potential for the offshore Atlantic margin is unexplored, but preliminary considerations suggest that CO2 sequestration options are significant along the entire eastern seaboard. Given the limited sink availability in onshore locations of the eastern U.S., and the potentially promising offshore locations, subseafloor injection warrants further evaluation. Environmental, economic, and socio-political issues will need to be considered before determining which geologic sinks are most suitable for CO2 storage.